This page provides links to resources for the Amber DRPG System. It is by no means complete, but a result of what I've located on the web that is of some interest. Please let me know if there are any problems with the links. Thank you! There are more rumors or details of an upcoming film on SciFi Wire. "The Chronicles of Amber" - Based on Roger Zelazny's best-selling 10-volume series, this four-hour miniseries tells the story of a royal family with amazing powers over time and space, which is plagued by in-fighting as it tries to unite against a sinister enemy. Richard Christian Matheson will write the screenplay. Tom Patricia of Patriarch Pictures will serve as executive producer. I will post more information as I learn of it. There is a place where Amber can be played on line. Check at www.RPOL.net! Search for active Amber games. Some games may be looking for new players. A review appeared in "Dragon Magazine" Issue 182 June 1992 pages 96-100. Now, there's a new review of Amber Diceless over on www.rpg.net. 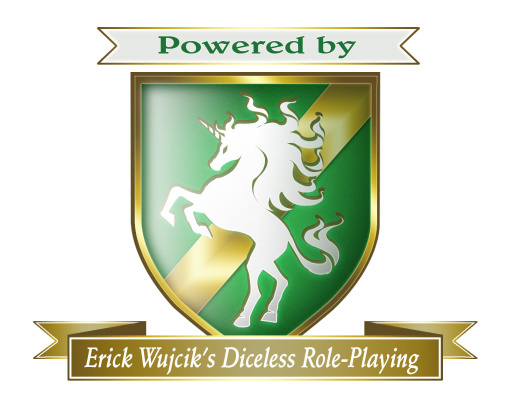 Diceless by Design, Incorporated, the new Amber publishing company headed by Edwin Voskamp and Eric Todd. Ambercon website! Note that "The Black Road" has moved: www.theblackroad.com. Shadows of Amber - an Amber forum. GURPS Amber by Steve Peterson, published in Brandon Blackmoor's site for Black Gate Publishing. GURPS Amber is hosted by RPG Library. 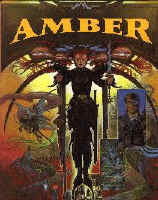 Roger Zelazny - Amber Only one real world... Hiroshi Okawa's is a Zelazny fan. His graphics were used for covers of the Korean version of the Amber series (1st and 2nd). A tour of his graphic art is in the "Virtual Shift in the Amber World". The Suburbs of Amber by Marissa K. Lingen - about Ursula K. Le Guin's book "The Language of the Night". Zelazny & Amber by Scott Zrubek. Madeline'sProto-Amber Page. With the 'Annotated Amber' and 'A Canonical Timeline of the Events of the Corwin Chronicles'. Karen Alfrey's "Nine Rednecks in Amber". In the Shadow of Greatness - by Arref Mak. Comments on Amber and RPG's. BLOG Jvstin style - by Paul Weimer. Comments on Amber, RPG's, and other interest. Yahoo! Groups: courtsofchaos - Friends of Courts of Chaos. Owner is vramin_the_green_mage. Evil Overlord, Inc. by Peter Anspach. Bookery Fantasy of Fairborn, Ohio. (937) 879-3940 or (937) 879-1408. My local resource for gaming material. Feng Shui Action Movie Roleplaying by Dave Blewer.